Monarch has hit the streets! 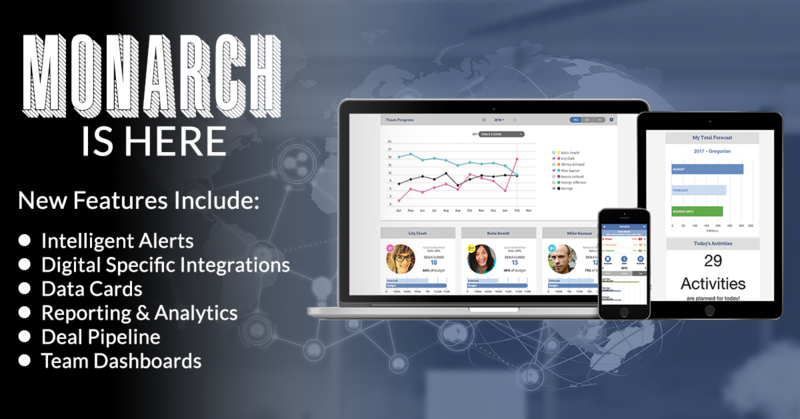 As far as media technology goes, Monarch is the only media data hub with integrations, CRM, intelligence, forecasting, OMS capabilities, reporting and analytics specific to the media world. Built for the modern sales workflow, Monarch is customizable to match the changing needs of media clients. With highly specific and native integrations, a robust and intuitive CRM, customization options and world-class support, we have revolutionized the media ad sales experience, building on our historic foundation with a new underlying, modern architecture, expanded digital functionality and a host of new features designed to meet the changing world of media ad sales. Intelligent Alerts - Build out custom alerts based on 1st or 3rd party data inside Monarch. Data Cards - Hyper-customize the information and data you see on accounts and contact pages. Reporting & Analytics - Newly developed reporting tools to quickly build robust and complex reports. Deal Pipeline - A visual representation of your deal pipeline, complete with time to close and deal weighting. Team Dashboards - A series of dashboards to showing how the sales teams is performing, who’s selling what kind of advertising, and who could use assistance. Interested in seeing the platform yourself? Request a personal tour of Monarch today! Matrix Solutions and Katz Media Group (Katz), the nation’s leading media sales organization in audio and television advertising, together offer a forecast and pending business reporting system for its broadcast partners. The Matrix platform combines the local and national pending advertising business into one system providing broadcasters with a comprehensive forecasting tool within the Matrix platform. As part of its new architecture, Matrix Solutions added the Katz integration to streamline, automate, and create a single hub where Matrix Solutions clients can manage their disparate data. With the new connected API workflow, Matrix Solutions and Katz provide a comprehensive, streamlined forecasting platform — without having to bounce between systems — that also automates a portion of the proposal reporting process. 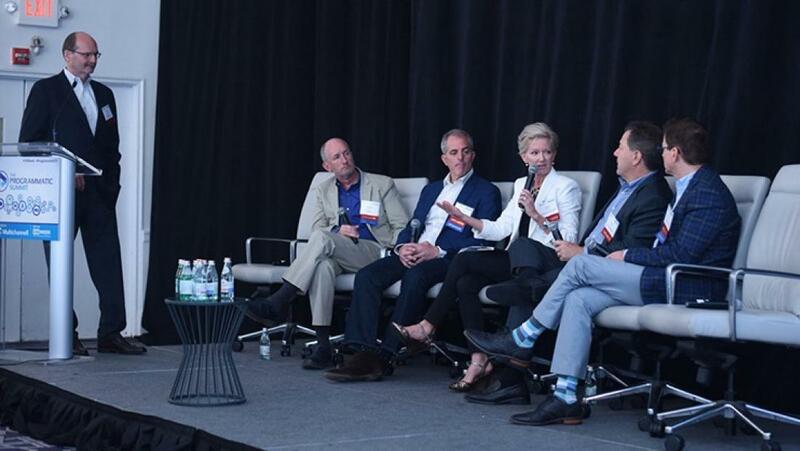 Matrix Solutions' CEO, Mark Gorman, was included in a panel discussion at the Programmatic Summit, held June 13 in New York as part of B&C and Multichannel News’ VidWeek, during which participants took a big-picture look at local TV, and how automated advertising could benefit the industry. In our latest blog post, Mark Gorman shares thoughts and obvservations from the aforementioned Programmatic TV Summit. "We are all discussing 'programmatic tv' or 'technology enabled buying' or whatever the current term may be. The Programmatic Summit was a nice summation of today’s viewpoints, with three key areas shaping most of the conversation around programmatic: audience, inventory, and measurement." In this episode of the podcast we talk with Matt DeRienzo, Executive Director at LION Publishers, about the changing state of media ad sales in the world of publishing. Matt has been in this industry for years and has worked in nearly every aspect of the publishing world. There is a balance that sales reps need to strike between pleasing advertisers and creating ads that are relevant to the audience. How can publishers of all size leverage data to create compelling advertising that brings in revenue? Also, we talk about how to staff media sales organizations to bridge gaps and leverage data to grow reader revenue and provide relevant advertising to their audience. Past episodes of the Matrix Media Sales Podcast. Save the Date January 21-23, 2018! We have set the date and location for Media Sales Symposium 2.0 happening January 21-23, 2018. Be sure to sign up for event e-mails to stay in the loop on location announcment, speakers, and more. Our commitment to building better and more empowering sales tools for the future is unwavering and to that extent we understand just how important it is to get industry leaders together to discuss challenges, opportunties, better ways of doing things, and what's next. The symposium provides the forum to do just that! We hope you will join us in January for this exclusive event that is sure to set a new mark for driving media ad sles success! Interested in being a panelist or speaker at our next Sales Symposium? Email Dan today to discuss details! Local ad revenues will continue to grow over the next four years and reach $174 billion by 2021, according to new projections from BIA/Kelsey. That figure equals out to a compound annual growth rate of 3.8%, which will be driven by double-digit increases in mobile and social advertising as well as local online and mobile video, all due to grow 17% by 2021. Mobile advertising accounted for more than half (51%) of the record-breaking $72.5 billion spent by advertisers last year, according to the latest IAB Internet Advertising Revenue Report, released today by the Interactive Advertising Bureau (IAB), and prepared by PwC US. The total represents a 22 percent increase, up from $59.6 billion in 2015. Mobile experienced a 77 percent upswing from $20.7 billion the previous year, hitting $36.6 billion in 2016. Don't miss our TVB Webinar with Mark Gorman happening on August 2nd from 1PM - 2PM. Then, catch Matrix Solutions at two fantastic events in September. More details below!